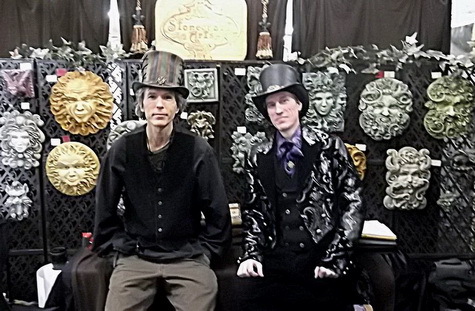 About the Artists – "Fine sculpture for every environment"
The sculpting duo of James Miller (right) and Geoffrey Stolle (left) have been creating esoteric garden sculpture in architectural concrete and bronze under the business name of Stonecraft Arts for over 20 years. Their designs reflect the gothic, baroque and neoclassical designs of renaissance Europe, but have a decidedly contemporary look to them as well. Images like gargoyles, grotesques, and the ever popular Greenman are recurring images in their repertoire. Although the designs are based on ancient archetypes, all of their designs are completely original, they do not sculpt replicas, and they are only available in a handful of stores in TX, NM, AZ, CA, and CO. The work ethic and artistic mission of Stonecraft Arts is very different from most companies; they encourage spiritual practice and diversity among all of their employees and apprentices drawing on a variety of esoteric spiritual paths; including Buddhist, Taoist, Kabbalist, Rosicrucian, Yogic and Ancient Celtic and Germanic traditions. In their community home, James, Geoffrey, and the apprentices stress health of mind and body. Meals are mostly vegetarian, organic, and incorporate a high degree of “raw cooking”, Vipasana Meditation and Hatha Yoga are practiced regularly, and environmental awareness is stressed in all areas of living and working. (Stonecraft Arts refuses to cast their pieces in toxic resins or use paints that are not Earth friendly).